BPI Groups can be automatically generated and synced with existing hostgroups and servicegroups, and rules can be set for determining their group states. Improved permissions scheme. Only Admin-level users can add, modify, or delete groups. All other users can be added as “read-only” users for each group, which allows for use of BPI in multi-tenancy installs of XI. Groups can now be sorted by problem “weight,” which allows for quicker identification of problems within the business process. Group state calculations now use health percentages instead of problem counts in determining group states. Group state calculations can account for “handled” problems in the logic, as defined as a config option. More informational feedback for the check plugin so a user knows “why” a group is in a problem state. Created an XML cache/API for reduced CPU usage for BPI checks, and also to allow external applications to access the data. See the updated documentation for BPI v2 here. The code for this new version has not yet been released. Feel free to contact me if you’re interested in beta testing before the 2012 release of Nagios XI. Here are a few screenshots from the new version. 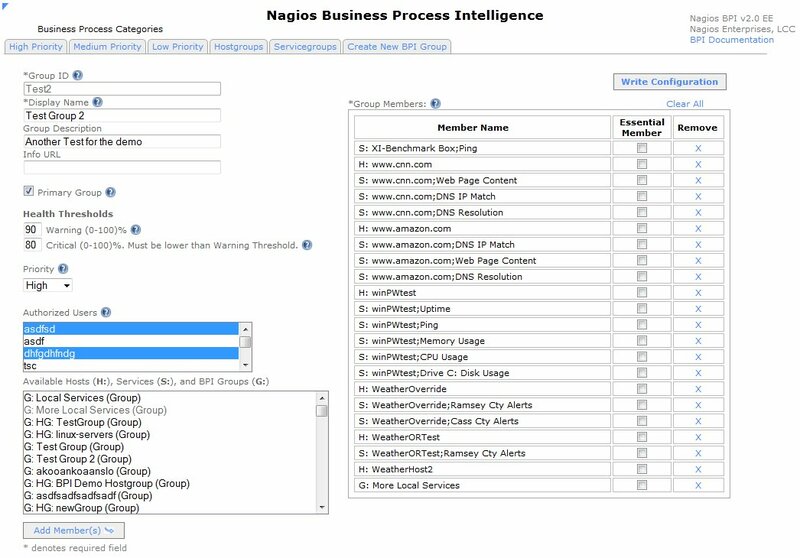 UPDATE: Advanced business process monitoring (BPI v2) is an Enterprise-only feature of Nagios XI. Learn more about the differences between Standard and Enterprise here. Category: Business Monitoring, Components, Development, Nagios XI, Tech Tips, UI, Uncategorized and Visualizations. 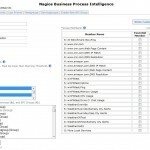 56 Comments Tags: BPI, business activity monitoring, business process. i`m interessted on beta testing. Can you give me access please ?! i’m interested on testing Nagios BPI 2.0 Beta too. Can you send me download link please ? I’m using now current version of BPI, but I’m really interested in beta testing new 2.0. Could you send me a link please? I am interested in beta testing new 2.0 version. I am currently using version 1.3.1. Could you please send me a download link please? we are Nagios Enterprise Partner and are very interested in the new 2.0 version for testing. Could you please send me the download link please. Could you please send me a download link ? 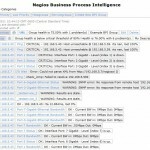 I use Nagios BPI for several client company installation. I would like to test the new version please. Please send me the download link. 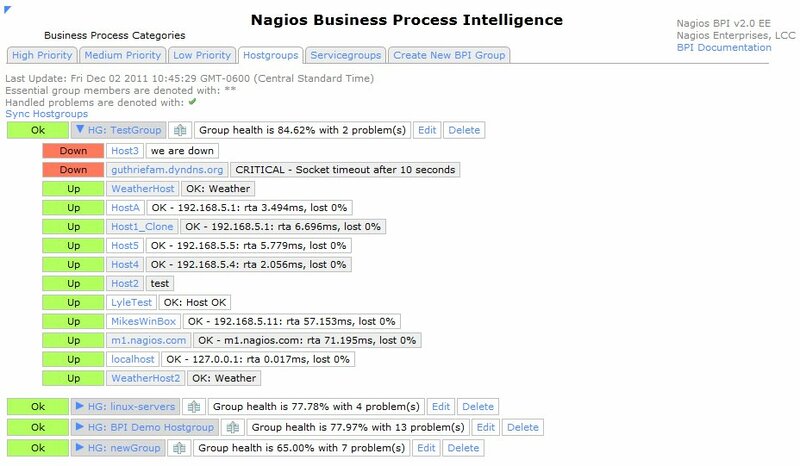 We are using Nagios XI for our customers and would be thrilled to be able to test the beta BPI. Can we please have the download link? I’d like to test it. Could you send me a link to downlad it. i`m interessted on beta testing. I am intrested in BPI Beta testing. Can you send me the down load link please. am intrested in BPI Beta testing. Can you send me the down load link please. Would it be possible to be part of the beta testing for the Core release of nagiosbpi v2? Currently I haven’t ported the changes to the Core version of BPI quite yet. I probably rewrote almost 50% of the code for the new version, so it may be a bit before I have the 2.0 community version ready. However, I’ve got you down as a interested beta tester for when it gets there. Thanks for the offer! I have the latest version of core installed now with openSUSE 12.2. When the next bpi is ready let me know. I too am intrested in the Core version of BPI. Can I also be put down for beta testing when the time comes? Sure thing. I’ve begun compiling a list for when that times comes. I’ve got your name down. Thanks for your interest! Hi, had a play with 1.3.1 and it looks brilliant. Very keen to have a look at and test 2.0. Some of the added functionality looks exactly what we need (user access in particular). I would like to be included in the testing of 2.0 it looks like a nice update. I would like to be included in the BETA testing as well. Please send me a link. I would like to be included in the testing of 2.0 too. Please send me the link. Currently testing v1. Can you please send BPI v2 beta link? Nice Add-on but not completed i think. I perefer to create report based on my BPI tree. I mean Nagios BPI can be used as service tree and we can calculate our service availability based on BPI alarms. But there is no option about it. Once you create service checks against the BPI groups you can run any of the available reports against those services. 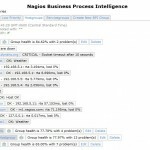 Nagios BPI also has a wizard that can be run to easily create new service checks for the business processes. We are just starting with nagios and think that BPI v2 could be a great add-on. Could you send a download link to test it ? We’re literally about a week away from releasing a public beta of XI 2012, which will include BPI 2. So at the moment we’re doing a freeze on the individual component testing until that beta is all set to go. We’ll post here to labs when the public beta is ready! hi, Can you please send BPI v2 beta link? Appears in version 2.0 which is the service problems “child name” in the notification email? be extracted and used in Nagios Core? If not, when would you estimate the beta for core would be available. we’ve been spending some time on NagiosBPI v1.3.1 lately and found it to be a very powerful tool. When 2.0 is ready for Nagios Core users, we would like to upgrade as soon as possible – the changelog looks very promising. 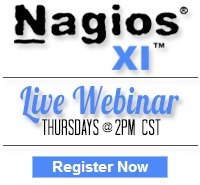 I’m beginning to fear, however, that 2.x will be a NagiosXI-only product – is this the case? If not, do you have any ETA on a Nagios Core version of NagiosBPI? Currently the 2x version of BPI is only for XI, but we do plan on updating the community version in the future to utilize many of the new features listed in this post. However, we don’t have an ETA on that at this time. Hello, has there been an update to the ETA of v2.0? Also, is there a link to the beta version of 2.0? Is there a beta link for core as well? Mike, this is a great Add-on to Nagios. I am using Core with my client and would love it if you could add me to the Core Beta list. I would like to join both the Core and XI beta lists, thanks. I am *very* excited to see the Core version of BPI 2. Put me down as a willing BETA tester !!! Can I please try out the BETA version of BPIv2? A download link would be greatly appreciated. Thank you! Still interested in 2.0 if it is available for download. Please let me know.. Thanks! The current version of BPI is 2.31, it is an Enterprise Edition only feature as noted at the bottom of the post. 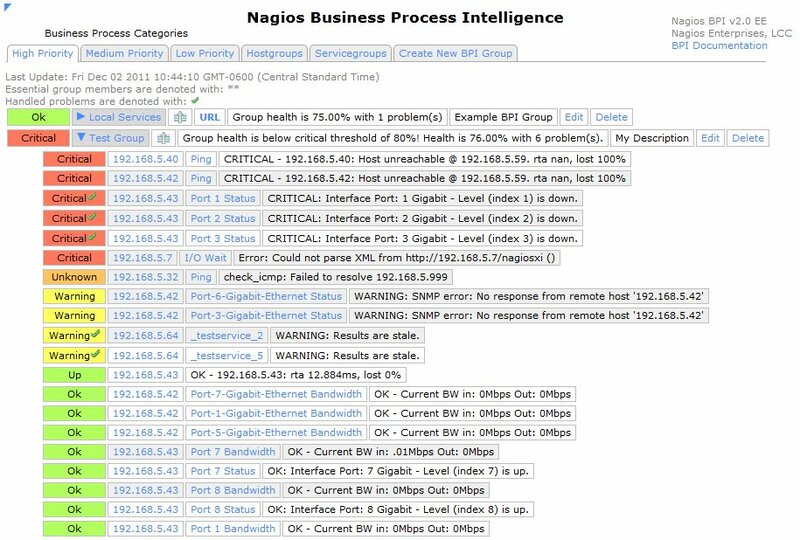 I’m interested to use nagiosbpi with the Core version of Nagios. May I ask you to send me a correct link to download a full version of nagiosbpi? I’ve used for long time an old version of this product and I found it very usefull. All last versions that I downloaded were non complete. Sone configuration components seem to be missed. I will be happy to test the last version (or beta version) in my production environment but, as I said before, in conjunction with Nagios Core. can u send me the link to BPI v2 ? Will nagiosBPI be made available on nagios core any time soon? I am very interested in see the BPI 2.x version for Nagios Core. Could you send me a link to download it. Nagios is the industry standard in IT infrastructure monitoring. Nagios Labs is where our techs talk about new projects, support issues, best practices, and the cool stuff that's coming. Nagios, Nagios Labs, the Nagios logo, and Nagios graphics are the servicemarks, trademarks, or registered trademarks owned by Nagios Enterprises. All other servicemarks and trademarks are the property of their respective owner. Website Copyright © 2009-2019 Nagios Enterprises, LLC. All rights reserved.